I've never been much of a fan of Elton John, but there's part of him that I'll now appreciate forever: his mischievous appendix. He was booked to headline Friday night in Hyde Park, supported by Ray Davies and Elvis Costello. But that vestigial little beauty buried in his guts began to swell up with pus like a pro, resulting in a quick trip to the hospital for Elton, and a rapid reorganisation of Friday night's festivities for the organisers. To their credit they didn't cancel the event, deciding to refund everyone who'd bought a ticket and release the remaining tickets for free. 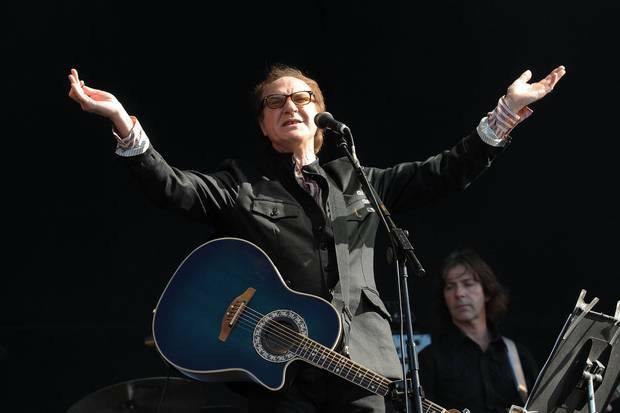 Ray Davies thus got bumped up the bill, going from support slot to headliner and being granted a roomy 90 minute set. Can you think of a more pleasurable time to spend a balmy Friday night than hanging out in Hyde Park and singing along to Kinks songs - for free? Didn't think so. Further cheering me up was a complimentary press bar, so with the application of some rather easily transferable wristbands I was buoyed up by free booze. "Now I'm sitting here / Sipping at my ice cold beer / Lazing on a sunny afternoon." I suspect these lyrics would have sprung to mind whether or not I was seeing Ray Davies, but right then they summed up the moment perfectly. Leaving Ray Davies aside for a moment, this part of Hyde Park has been walled off for the 'British Summer Time' experience. As far as festivals go this was pretty extravagant, especially compared to the hot and dusty misery of Hard Rock Calling a few weeks ago. The restaurants and bars ringing the arena were fake/permanent buildings designed to create kind of ersatz Prince Charles-y English seaside village atmosphere. There's fake pubs, fake cocktail bars and fake restaurants (albeit with painfully real prices). It's a bit kitsch, but I'd much rather something with a bit of personality than a boring old row of vans. Anyway this bucolic Englishness fits in quite well with the headliner, the founder of his own 'Village Green Preservation Society'. Similarly impressive was the stage itself. Fake greenery festooned the lighting rigs and sound desk, and the stage itself was outlined by enormous fake trees that ringed the stage with leaves, an enormous curved panoramic video screen behind the performers and two large, curved video screens in front. The description makes it sound a bit lame - literal fake plastic trees - but the execution was outstanding. The stage almost melted into the background, a clever bit of and instantly impressive bit of design. And so to Ray. In June I got strangely depressed at watching The Stone Roses amble their way through songs written 25 years ago, yet here I am listening to someone playing songs written maybe 45 years ago (You Really Got Me will be 50 next year!). Yet there's a lack of pretension here - whereas The Stone Roses were middle-aged men unconvincingly miming the anger of working-class youth, Ray Davies approaches his material through a prism of age and experience. So while the punky kick to the riff of All Day & All of the Night remains intact - there's a palpable difference between a man of 20 singing "I believe that you and me last forever / Oh yea, all day and nighttime yours, leave me never" and a man of 69. His voice is poignantly cracked and worn like an old pair of shoes. After all, 'Forever' is a very different concept for someone approaching their 7th decade on this planet than some fresh-faced kid with long hair hanging around his face. This perspective of age works surprisingly well for the majority of the Kinks iconic catalogue, the best songs existing in a perpetual wistful dream state. Sunny Afternoon prompts an enormous sing-a-long from the crowd, one that Ray encourages by pausing in the middle, slowing down and letting the crowd take over lead vocals. The timing of this couldn't be better, the sky turning a purplish shade, the shadows of Hyde Park dragging over the crowd as the sun sinks towards the horizon. It's a similar story on Waterloo Sunset, the opening chords sending shivers down my spine. Sometimes there's a time and a place where everything just slots into place, and this song, being played at this moment in time, in this place just feels right. It's the closing of a loop: 47 years ago this song we're hearing was recorded at Pye Studios near Marble Arch, within sight of the main stage. Ray sits on a stool as if surveying his kingdom during the opening bars, leaving it as the song builds and builds and the crowd bellows "As long as I gaze on Waterloo sunset / I am in paradise". He finishes with a triple punch of You Really Got Me, Days and finally, predictably (but no less enjoyably) Lola. The distorted, blown-out riff of You Really Got Me still gets the crowd bouncing after all these years. By this time I'd drank a hell of a lot of free beer, been given a load of cheap white wine by some friendly middle-aged women in Elvis Costello t-shirts and glugged down quite a bit of straight Bacardi. There comes a time for dancing like a big maroon. This was it. Though I enjoy the hell out of Days, it's Lola that caps off the experience perfectly. 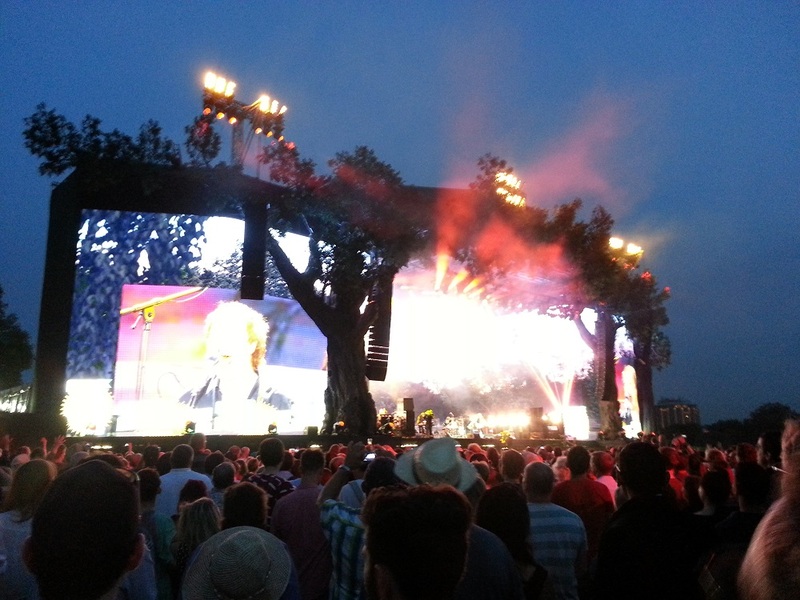 Ray changes into a Union Jack top and kicks into the iconic, slightly ramshackle intro. 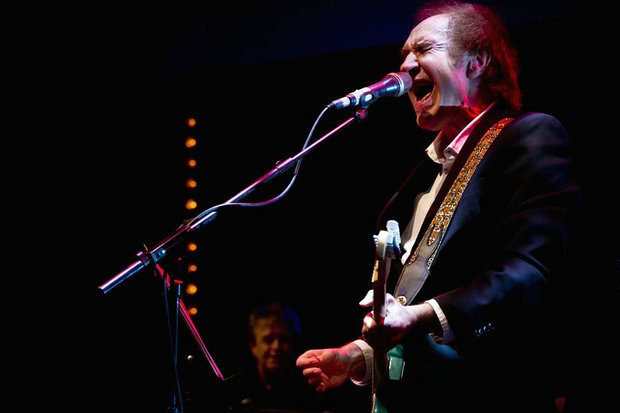 Lola is my favourite Kinks song and hearing it live fills me with an effervescent glow. As I bounced round like an idiot, yowling along to the song I felt joyous - not just at the music, the surroundings, the weather, the booze or the lovely crowd - but at the sheer joy of realising you're in the middle of a halcyon moment - feeling the present slipping seamlessly straight into treasured memory. The 'British Summer Time' folks, whoever they are, deserve a huge pat on the back for putting this gig on for free. I couldn't have asked for a nicer Friday night. Big thanks too must go to Elton John's malfunctioning internal organ. Without the assistance of this wonky appendix this night wouldn't have been possible. Great review. My sentiments exactly. GREAT review and it totally captures what we Kinks/Ray fans feel about our hero. I'm grateful that you can see the beauty in Ray's music and performances. There's nobody like him! Whenever I see one of his shows I feel like I'm in heaven. Thank you. Thanks Neon Sign - this comment really made my morning!